21 Aug? U-102 von Kloth Unknown ¤North Sea? § -- A semiofficial British account (1954) says 20 March. §§§ -- The most recently published British research suggests U-47 and U-70 sinkings should be transposed. §§ - Second sinking: sunk 3-11-40, Schillig Rds., by RAF, raised and recommissioned. § -- Latest British study transposes these two sinkings also. §§ -- Damaged by and surrendered to Sqdn. 500, but signals not seen by 820 Sqdn., who then sank her. § -- See Dessie under Italians, inf. §§ Br. Admiralty advises U-640 and -657 should be transposed. §§ Br. Admiralty indicates these two positions should be transposed. 19 Oct U-957 Schaar Rammed 19th by Ger. trspt. ; out of service, Narvik, 21st. 9 May U-2538 Klapdor Mine Off Marstal, SW Aerö I. 16 May U-873 Steinhoff Surrendered Portsmouth, N.H.
N.B. Over 150 U-boats were scuttled in northern ports the first week in May '45-15 in Wilhelmshaven, 10 at Hamburg, 31 in Travemünde and 26 in Kiel the 2d. and 3d; 56 in Flensburg alone the 5th. From then till the end of June, approximately an equal number of submarine crews surrendered to the Allies from Narvik to Portsmouth, N. H., and a straggler or two at the River Plate as late as mid-August. 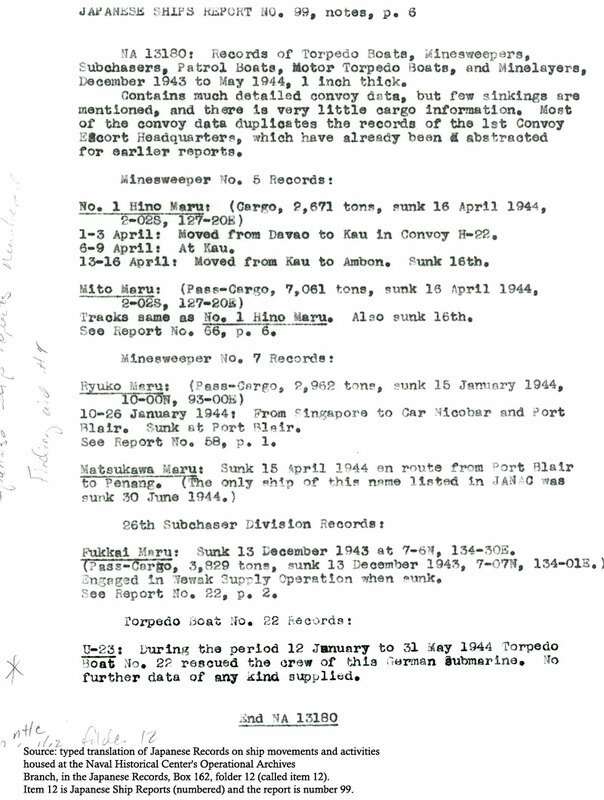 To pinpoint terminal date and locale for an individual U-boat, consult the general index, as space in the two paragraphs immediately following permits only a skeleton listing of the 300 U-numbers. U-8, -14, -17, -29, -30, -37, -38, -46, -48, -52, -57, -58, -60, -61, -62, -71, -120, -121, -129, -137, -139, -140, -141, -142, -146, -148, -151, -152, -267, -290, -316, -323, -339, -349, -351, -370, -397, -428, -446, -474, -475, -552, -560, -612, -704, -708, -717, -721, -748, -750, -792, -793, -794, -795, -822, -828, -903, -922, -924, -929, -958, -963, -979, -999, -1002, -1016, -1025, -1056, -1057, -1058, -1101, -1132, -1161, -1162, -1168, -1170, -1192, -1193, -1196, -1204, -1205, -1207, -1277,-1303, -1304, -1306, -1308, -1405, -1406, -1407, -2327, -2330, -2332, -2333, -2339, -2343, -2346, -2347, -2349, -2352, -2355, -2357, -2358, -2360, -2362, -2366, -2368, -2369, -2370, -2371, -2501, -2504, -2505, -2507, -2508, -2510, -2512, -2517, -2519, -2520, -2522, -2525, -2526, -2527, -2528, -2531, -2533, -2535, -2536, -2539, -2541, -2543, -2544, -2545, -2546, -2548, -2551, -3001, -3002, -3004, -3005, -3006, -3009-3016,-3018-3029, -3031, -3033, -3034, -3037-3040, -3044, -3501, -3502, -3504, -3506, -3507, -3510, -3511, -3513, -3516, -3517, -3518, -3521, -3522, -3524, -3526-3530, -4705, -4707, -4710, UIT-2, -3, 6-14. U-59, -101, -143*, -145*, -149*, -150, -155*, -170*, -190, -218*, -234, -244*, -245*, -255*, -256, -262, -276, -278*, -281*, -291*, -293*, -294*, -295*, -298*, -299*, -310, -312*, -313*, -315, -318*, -324, -328*, -363*, -368*, -369*, -427*, -481*, -483*, -485*, -510, -516*, -530, -532*, -539*, -541*, -555, -637*, -668*, -712, -716*, -720*, -739*, -758, -764*, -773*, -775*, -776*, -778*, -779*, -802*, -805, -806, -825*, -826*, -827*, -858, -861*, -868*, -873, -874*, -875*, -883*, -889, -901*, -907*, -926, -928*, -930*, -953, -956*, -'968*, -975*, -977, -978*, -991*, -992*, -994*, -995, -997*, -1004*, -1005*, -1009*, -1010*, -1019*, -1022*, -1023*, -1052*,-1054, -1061*, -1064, -1102*, -1103*, -1104, -1105, -1108, -1109, -1110*, -1163*, -1165*, -1171, -1194*, -1197*, -1198*, -1201, -1202, -1203, -1228, -1230*, -1231, -1232, -1233*, -1271, -1272, -1275, -1301*, -1305, -1307*, -2321*, -2322*, -2324*, -2325*, -2326, -2328*, -2329*, -2334*, -2335*, -2336*, -2337*, -2341*, -2345*, -2348*, -2350*, -2351, -2353, -2354*, -2356, -2361*, -2363*, 2502, -2506, -2511, -2513, -2518, -2529, -3008, -3017, -3035, -3041, -3514*, -3515, -4706.